Mapping for Good returns this month to highlight a grassroots project that’s mapping pirate radio stations in Brooklyn. While we’re not going to say we officially condone pirated radio as it is illegal under FCC regulations, we will say that we are of course in favor of free speech and local initiatives to get voices heard! PirateRadioMap does just that and more by showing users what stations can be found depending on what neighborhood one is in and much, much more. Above: a screenshot of neighborhoods, available stations and the live streaming tool found in PirateRadioMap. We’ve covered a vast spectrum of mapping projects in this column over the years. Some have millions of dollars in funding, others have hundreds of thousands of users…all of this is great and in many cases vital to the particular mapping need being addressed. Sometimes, however, it’s the homegrown and no-frills stuff that gets the job done, and we’d be lying if we didn’t say we’re huge fans of projects of that sort. But first for those of you who might not be aware, let’s cover what pirate radio is in the first place. All of us are familiar with standard radio broadcasting, which in its most common forms is transmitted FM (frequency modulation) and AM (amplitude Modulation). In either case, both are regulated by the Federal Communications Commission, known commonly as the FCC. Some people feel that the FCC’s regulations and requirement of licensure inhibit the ability of “everyday” voices to make it on air, while others believe its censorship prevents true free speech from making the airwaves. No matter how you feel, there are people out there who’ve already decided to take radio into their own hands. Enter pirate radio. Regular people at home modify or create equipment that transmits in frequencies that radio receivers pick up and broadcast, well, whatever they want! The problem is, however, that finding them is not exactly easy. After all, they aren’t regulated and generally don’t advertise so it’s kind of a shot in the dark to even find them. PirateRadioMap hopes to solve this problem so that users can find out where they can listen and to what they can listen. 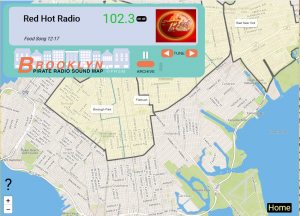 Users can click on sub-sections of Brooklyn and a list of radio stations and their respective frequencies will pop up! Why is this even necessary you might ask? Pirate radio stations usually aren’t transmitting at the frequencies that normal FM or AM would do, so their signals are hyperlocal in their given ranges. One channel might literally only reach one neighborhood. With PirateRadioMap hobbyists and casual listeners can sort through the many garage operations out there and find what interests them most. Best of all, you can stream many of these stations on the site itself! And while this map is specific to Brooklyn, it should be stressed that pirate radio is all over the country and world. If it’s a hobby you might feel inclined to check out, well, you didn’t hear about it from us! This entry was posted in The Geospatial Times and tagged Mapping For Good, pirate radio, The Geospatial Times, Tips & Tech, web mapping by Apollo Mapping. Bookmark the permalink.